Just to remind all beekeepers that we will be hosting the National Bee Unit’s, ‘Beekeeper Advice Surgery’, on Saturday July 15th from 2pm until 5pm at the Picton Centre, Freemens Way, Haverfordwest, SA61 1TP, which will cover bee diseases etc. Details on this can be obtained NBU Advice Surgeries Flyer 2017. We strongly recommend that you make every effort to attend for the sake of your bees! All beekeepers and would be beekeepers are welcome!! Carmarthenshire Beekeepers’ Association (CBKA) is one of the associations hosting the National Bee Unit’s Disease and Comb workshops this season. We have received an invitation from the CBKA for PBKA members to come along to their venue and take part in the workshop. The workshops will give detailed insights on the notifiable diseases, American Foul Brood and European Foul Brood, as well as looking at the overall disease situation in Wales and updated approaches to its control. Beekeepers will learn about other pests and diseases, in particular Varroa and its associated viruses, that can pose a risk to their colonies. The Inspectors are licensed to bring with them examples of diseased comb. Participants will have the chance to examine these live examples of disease and put their learning into practice, on the day. There is plenty of parking, no charge for the workshop and refreshments will be provided. Please advise the PBKA secretary, Lesley Williams asap, if you wish to attend in order that we can advise the CBKA of numbers. MAQS® Beehive Strip has received registration in the United Kingdom for beekeeper’s use. It has received approval by VMD (Veterinary Medical Department). MAQS® is a saccharide gel strip formulation of formic acid, an effective active ingredient that is naturally occurring in honey. Because the Varroa mites reproduce on the developing baby bee, transmitting viruses that deform the bee, their control is being approached as a brood disease. The saccharide gel formic acid vapours released from the saccharide gel strip penetrate the brood cap, stopping the mite where it reproduces. The initial target was the male mite, which never leaves the brood cell. However, trials show that it is also very effective on all stages of the female mite. It is the first mite treatment to successfully target Varroa mite reproduction. The concept of MAQS® Beehive Strip was first developed in Canada, by NOD Apiary Products Ltd. operating in the UK as NOD Europe. NOD’s personnel worked with BASF’s scientists to overcome technical barriers, the solution to which was BASF’s biodegradable and compostable film Ecoflex®. The resulting treatment is just 7 days. The physical product will be available in the UK from early April 2013. MAQS® stands for Mite-Away-Quick Strips®. NOD stands for Natures Own Design the developers of the product. You can find out more on the NOD website here. Randy Oliver has carried out an early summer test in 2011 and the results of this are published on his excellent Scientific Beekeeping website. 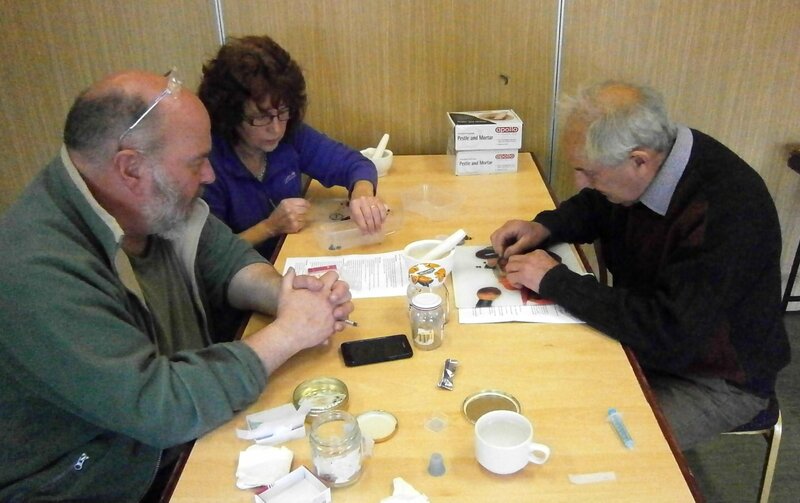 On Sunday April 15th ten of us got together to carry out testing for nosema. 19 samples of bees were brought along and, after prepartion, were examined using the compound microscope were recently obtained with the grant from the Trustees of the John Hall legacy. To see the full report and images of testing results click here. Nosema can build up in overwintering colonies and to cause early death of bees. Members are reminded to bring along a sample of bees from each hive to the Picton Community Centre, Haverfordwest on Sunday April 15th between 2.00 pm and 5.00 pm to test them for nosema. The Association’s new microscopes will be on display and the high powered one will be used for testing. Click here to find out how to collect the sample. To find out more about nosema click here to visit the Beebase website (but note that Fumidil B is no longer the recommended treatment although it can be used if you are able to obtain, or have, a supply). The Vita website also has a page on nosema, Vita Feed Gold has, in trials, been shown to helpful in reducing nosema spore levels. Those of you who were at the AGM to hear Frank Gellatly or who have read this month’s edition of Bee Craft will be aware that Fumidil® B, which was the only recognised treatment for nosema, is being withdrawn from the UK following a decision by the Veterinary Medicines Directive (VMD). This brings the UK in line with the rest of Europe. Manufacturers have until June 30th to sell stock and retailers can sell the product up to its expiry date. This document (Word format) on the VMD/DEFRA website quotes a shelf life as packaged as 2 years. So, in theory at least, this could be on sale until the end of 2013 – although it is very doubtful that suppliers will have stocks at that date. Bees over-wintering are mostly confined to their hives and this crowding together with the extended life of workers provides conditions for the build up of nosema spores in the abdomen. Find out more about Nosema on Beebase. We are running a nosema testing workshop on Saturday, April 9th starting at 9.30 and closing at about 3.00 pm. This will be held at the Picton Community Centre adjacent to the County Hall car park which is free on Saturdays. If nosema is diagnosed, treatment is advised by dosing feed with Fumidil B. For this workshop, members must bring a sample of bees from each hive, collected as described in these instructions. If anyone has any innovative ways of collecting flying bees we would be glad to hear about them.